High school angst and teenage drama is front and center. Billy, like all awkward teens, is trying to figure out where he fits in with the world, particularly with the Power Rangers in general. While they all have the skills to fight, his skill is the one of tech. Not feeling particularly comfortable with this, he turns to Trini, who helps him realize that he is more than just “that” guy. 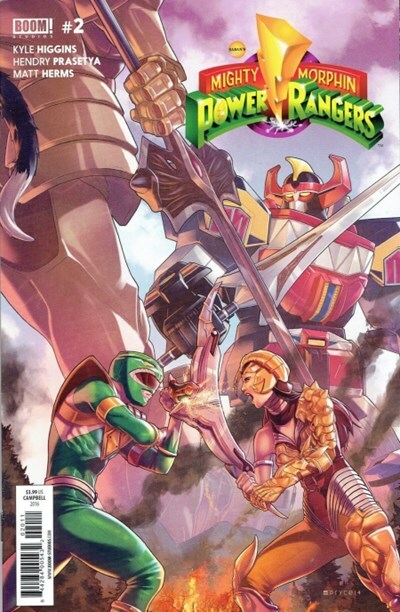 The real story here is the continuing saga of Tommy, the Green Ranger. He is torn between doing the right thing and giving in to the temptations from his past. Rita is still a haunting force in his life, and he tries his best to ignore her constant presence, and not only psychologically. The physical powers and influence she has are a danger to him, his fellow Rangers, and the world. As the series progresses, the true threat starts to unfold. Not only is the fate of the Rangers on the line, it’s quite possibly the fates of every human being on the planet. One thing that particularly stands out from this series so far is the writing. Being based around high school age students, they are smart and never written as a stereo-type. The typical teenage stuff is there, but it’s not overwritten to the point of annoying. That is what I like; it’s fun, takes itself seriously but not too serious, and is an overall fun ride so far.